Who makes big dog's wheels? Discussion in 'General' started by linx, Nov 24, 2009.
Who makes big dog's wheels? Just curious so I can figure out how big the whole is in the wheel to find out what size hubs it would take. Anyone know who makes them and have technical specs? Performance Machine? I was hoping maybe RC Components. I know RC made some back in the early 2000's. For example, the Big Dog Boxer in 2002. Might help if you update your profile to show what model/year bike you have. RC and PM made them and now Millenium is contracted by BDM to make them. Many threads here on this. I don't have a big dog. Wish I did. Just really trying to find out which bikes were made with RC components wheels, and if they are standard size opening that RC puts on all their wheels. That's why I wanted to know who makes their wheels. Current wheels are made here I belive . I wonder who made my wheels/sprokets, rotors? Anyone know the model these are?? What do you mean by "standard size openings"? Are you referring to axle size? If so then they are standard 3/4" front and 1" rear. RC had the "Sheriff" or "Marshall" model wheels that were on my 03 Mastiff. They were the 5 spoke style and I really liked them. Like the opening in the wheel, without the hub. If you take the hub off, what is the opening in the wheel. I just checked out those wheels, and they look nice. Not sure why you would need that as all wheels come with hubs and are based on width, height and axle size. But here is what they look like when they are apart. Ultimately I'm looking for whatever wheels RC Components made for big dog. I want to buy a big dog in the future, but as of now I'm stuck on a VTX. My bike is shaft drive. RC Components has the shaft drive wheels on lock down as they are the only company that make a shaft drive hub adapter. So, I have to use their hubs, and they claim that the center hole on their wheels is proprietary and other wheels will not work. Sounds like a bunch of hoop-la to me, but do I #1. Ignore it and find a set of wheels and use my new hubs or #2. Take heed to the advice and buy only RC wheels. They also claim that if they made a wheel for Big Dog, that it would not match the same center hole as their normal wheels. As far as I know, Big Dog is the only company to have ever used RC comp wheels in a factory setting. I guess what I need to find out is which bikes came with RC Component wheels. I know the 03 Mastiff did, and I really like those wheels, but finding a used set is going to be hard. I want to give a big shout out to you guys. This forum rocks, and so do you folks. Thanks for being accepting of my annoying questions and not kicking me, haha. 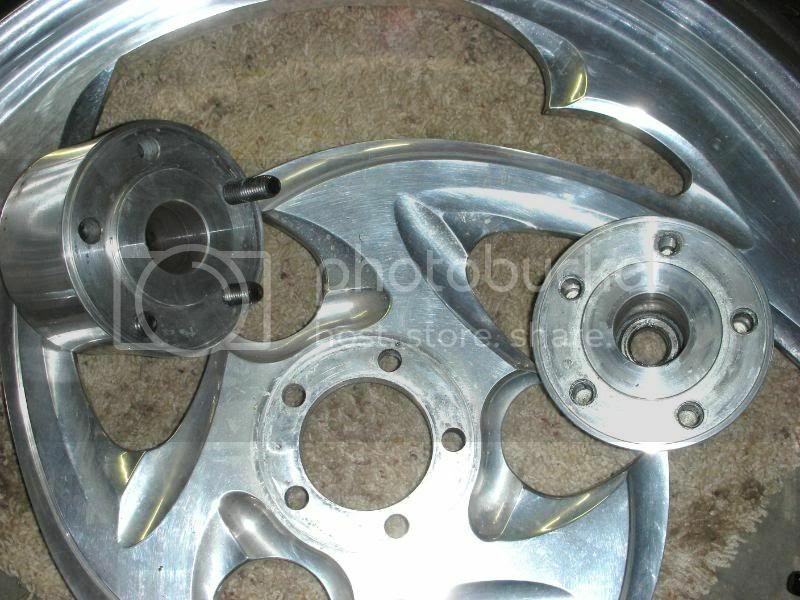 Well if you want one for comparison (no measurements) here is LDO's wheel off of his 03 Mastiff after he had them chromed. You can see if looks different then the BDM wheel I posted above. If you are considering putting them on your bike then have you determined if they will fit? What size tire do you have on it now? The 03 Mastiff wheels are 8 1/2" wide for a 240mm tire. This will be a big factor. They will fit with a modified swingarm. A 5.5 wide rear will fit with stock swingarm, but I don't mind buying a modified swingarm, or even modifying it myself. It's a really common thing to do for these bikes. 8.5" rear is max I can go, even with the modded swingarm, so really it's perfect. And the 21" front is just icing on the cake. That chrome wheel looks wicked man. God I wish I had a big dog. Any company that is cool enough to put something like those wheels on from the factory is a awesome. 2004 BD Chopper Does anyone know who makes this wheel and what model it is? Mad Clown, are what they are called. I believe PM made them. If your needing a new belt pulley, Get when Donna. They had them redesigned, so they are beefier, and Teflon coated.